Microsoft Build conference 2015. Yaaaaaaawn, we know. But hold on, you've forgotten that Microsoft is no longer the most boring tech company in the world - it's the company behind HoloLens, quite possibly the most innovative device it, or any other tech giant for that matter, has come up with in the last few years. And over in San Francisco, at the Build developer conference, the company showed off a live demo of the HoloLens headset in action. 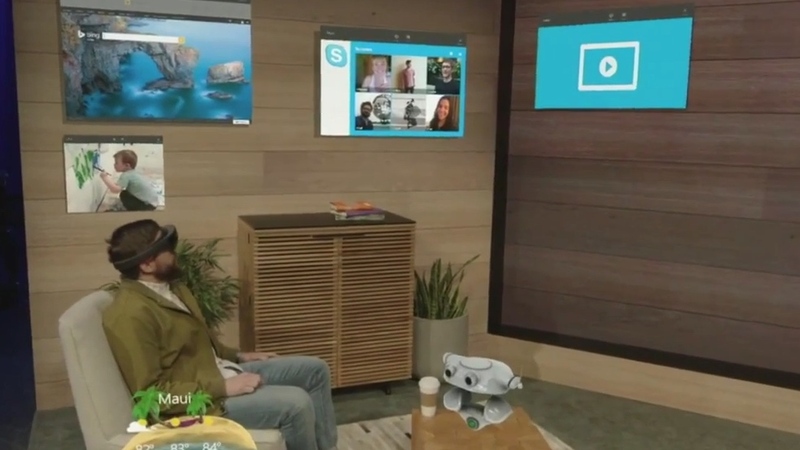 If you can't be bothered to watch the video, you're a busy guy, we get it, this little summary should suffice; it shows off a man in a living room environment pinning virtual screens to his walls (and resizing them), opening Skype windows and chilling with a robot. There's some stuff about medical research and some more robot action, but you get the gist. Microsoft has also released a new, behind the scenes video which shows off some early prototype designs and gives an indication as to how all the futuristic sounding tech is packed into the HoloLens headset. It's very cool, we're sure you'll agree. We can't wait to test one out.